Phew…one week done and only a few more to go! I have to admit, this past week was kind of hard to get through. I thought that since these weren't in-studio classes, lasting between 60 – 90 minutes, that it would be a walk in the park, but some days I really had to force myself to get through all the classes. There was a great mix of challenging days, usually followed by a day focused on stretching and relaxing. I think what I'm most excited about, besides hearing how the challenge is going for you, is seeing my body improve. I know that the more we do this, the easier it will feel on our bodies and the more we'll look forward to our practice each day. Also, don't forget to keep tagging #yogachallenge when you share your photos on social media. Have a happy week #2! Here's a preview of the first three days. Just keep on reading for everything else below! 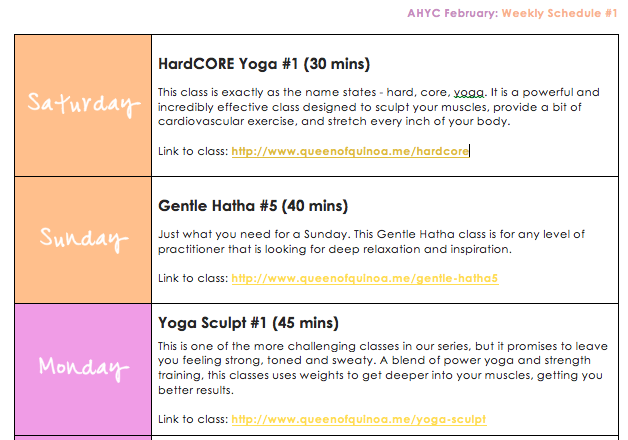 This class is exactly as the name states – hard, core, yoga. It is a powerful and incredibly effective class designed to sculpt your muscles, provide a bit of cardiovascular exercise, and stretch every inch of your body. Just what you need for a Sunday. This Gentle Hatha class is for any level of practitioner that is looking for deep relaxation and inspiration. This is one of the more challenging classes in our series, but it promises to leave you feeling strong, toned and sweaty. A blend of power yoga and strength training, this classes uses weights to get deeper into your muscles, getting you better results. Most of us spend countless hours each day slouched over a keyboard, and hunched over the wheel of the car while driving. Counter all of this rounding of the upper back by opening and stretching the front line of the body. Another round of our class from Saturday. Remember, this class is challenging and are classified as power yoga with a kick. You will feel these in your core, but those are good feelings! Our core is our stabilizer and the center of our strength. This class promises to leave you plenty sweaty and feeling like you've gotten the most complete, head-to-toe workout possible. Not only will you tone and sculpt every muscle group, but your stretches will be taken deeper than ever before. This is a basic Power Vinyasa Flow class and is great for advanced beginners, intermediate students, and everyone else looking for a fun and relaxing yoga class.